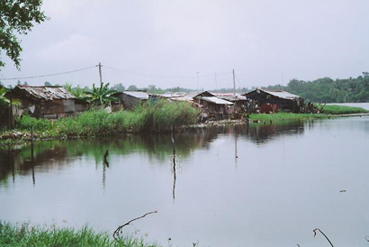 Community houses on the edge of the lagoon. Samarakoon Watta is approximately 10 km south of Sri Lanka’s capital city, Colombo. It is a 9 acre, low lying, waterlogged site, on the edge of Bolgoda Lake. Since 1974, more and more landless families have been living on the largely uncultivated and semi-abandoned site. At the start of the project in 2003, there were approximately 213 houses, 77% of which were unauthorised. The quality of the houses varied from sturdy semi-permanent construction to those which are poorly constructed and have leaking roofs and mud or sawdust floors. The community suffered from several acute problems. Surveys showed exceptionally high malnutrition rates amongst all children (36% of children under 5 were malnourished), the school drop out rate was far higher than the national average and the local environment poses omnipresent health risks to children and families alike (with uncovered and untreated drains that flood regularly, as well as the build up of refuse). Access to credit was poor, meaning that families tended to be trapped in a poverty cycle, and politicians had given little regard for a community whose dwellings are not legally recognised. Shining Life Children’s Trust (SLCT) formed a partnership with a local non-governmental organisation, the Human Development Foundation (HDF). 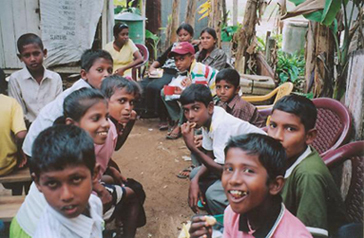 HDF implements development programmes with an emphasis on child focussed activities. SLCT’s role is to provide funds, technical assistance and management advice for the Samarakoon Watta project, and to monitor progress made. There was an initial 6-month project, followed by the main 30 month project. Further activities were then undertaken to help ensure the sustainability of the project. Children's day in the community. The goal of the project is to enhance the capabilities of children, mothers and caregivers in Samarakoon Watta, through education, credit and improving links with the wider community. Selected community members are trained so that they can also train other members of the community and, wherever possible, aspects of the project are planned and orchestrated by the community. All aspects of the project are designed with a long-term view towards sustainability, including establishing a community savings and credit programme. The project is managed by a locally trained officer who works in the community, and a community assistant, who lives in the community. Activities that have taken place in Samarakoon Watta within the sphere of this project include: Establishment of a community pre-school (along with training of willing community members as pre-school teachers), establishment of mothers' societies and children's clubs, health training, early childhood care and development training, micro-credit and the construction of a community building.